If you thought you’d collected a lot of crap on your holidays, wait until you see Mr Fogg’s. This place is literally stuffed with the detritus of the Victorian explorer of the name: every wall is covered with hunting rifles, stuffed animals, weathered flags and maps. All right, these are just the imaginary souvenirs of an imaginary traveller, but that doesn’t make the profusion of clutter any less dazzling – or any less fun. 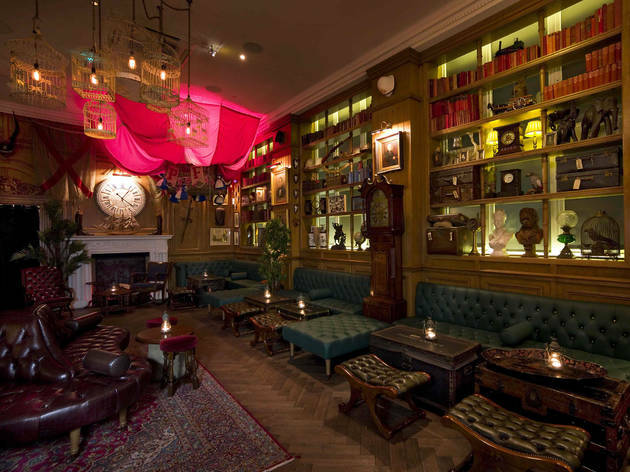 It'd be easy for cocktails to take second place with an interior like this, but at Mr Fogg's the seriously knowledgeable bar staff make sure they're punchy, exciting and altogether sensational. 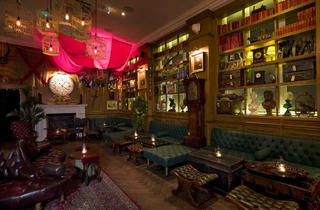 It’s not cheap – this is Mayfair, after all – but for sheer spectacle Mr Fogg's is hard to beat. Very cool bar tucked down a Mayfair street. Cocktails were delicious, if a little small for the high prices. We asked for nuts and were given wasabi peas, which were horrible and far too strong. This is an ideal place for a date/celebratory drink. 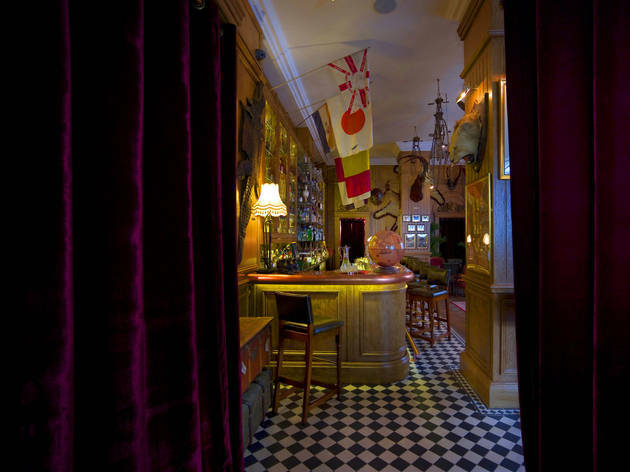 My Fogg’s Residence is tucked away in the back streets of St James Park and inside you’ll find a wonderfully eccentric venue and bar. Prices start at £40 and this will get you 1 full teapot of your cocktail of choice as well as mini sandwiches, cakes and sweet treats. There’s a large range from salmon buns to chicken wraps followed by chocolate brownies and red velvet cake followed lastly with an mini egg tart. Whilst the food is very good, there isn’t anything particularly unique about it. What you come here for is the buzzing atmosphere, the live music and the sense that you’ve been transported to another world. The venue is full of old-fashioned plush sofas and armchairs, empty bird cages, old artefacts, stuffed animals, portraits and more. It’s a real eclectic mix that is just so strange and striking that it just sort of … works? The staff are all dressed as if they come from another era which just adds to the whole idea that you’ve somehow stepped back in time. Your afternoon tea experience begins with a complimentary tipple as you peruse the menu. There are three different packages to choose from depending on how much you want to drink. You can opt for one pot of cocktail tea, as I did, for £40pp, or you can go for the bottomless champagne option, which is £72pp. There are then 6 drink options you can choose from: three spirited teas and three champagne teas. We both opted for spirited teas on this occasion, “Ladies that Lapsang” and “A Tropical Tincture”. The latter seemed significantly stronger and had a distinct tea taste whereas the latter was more like an alcoholic fruit cocktail mix. The staff are very attentive throughout your experience at Mr Fogg’s, always ready to give you a helping hand or top up your drinks. What’s more, there’s a live piano player in the corner who plays modern pop songs in a classical style, which is something really special. All in all, this is the sort of place where you could easily while away a couple of hours pretending you’re in the comfort of some gentleman’s manor as opposed to a bar in central London. 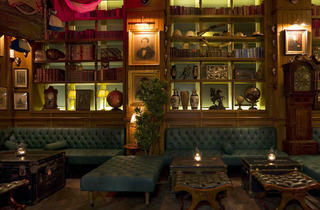 The decor really is on another level with a gorgeous bar area, decorated shelves and an eclectic mix of souvenirs. Perfect for: couples, double dates, group dates. Don't be late - or early for that matter - if you have an appointment with Mr Fogg! Everything from the exacting booking times to the curiosities hanging about the place make you feel you really are in a scene from Around the World in 80 days. The afternoon tea was slightly let down by the very average food selection (most of which was almost certainly shop bought) but the delicious teapot cocktails saved the day. Inception Group have done it again with another fantastic venue - a must visit! I'm not giving Mr Fogg's only four stars because there was anything wrong with the place. On the contrary! Everything is neat - the decorations are definitely for the win, but an extensive cocktail menu, friendly staff and comfy seating do help. It's just that unless you're ready to splash the cash, you really won't be able to drink more than two or three cocktails without feeling guilty - so the massive menu just makes your heart ache. Everything we sampled was delicious though - expect the unexpected with quirky drink designs and maliciously interchanging edible/non-edible decorations. 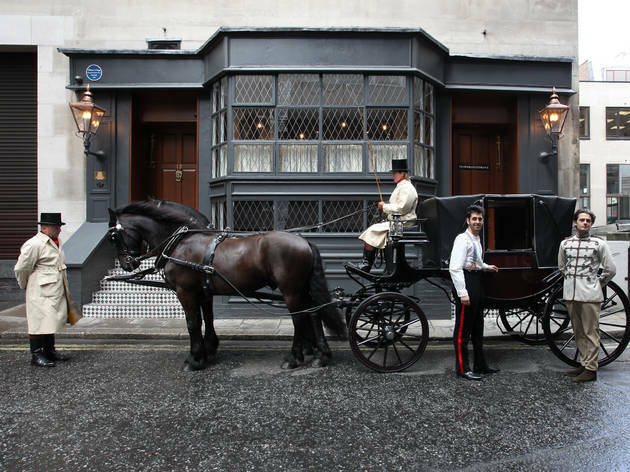 Staff are truly very kind and helpful, and the fact that there's no real dress code helps keep the place more relaxed than you'd expect in Mayfair. You get it all from the posh business group to the giggly couple (talking about a friend), so don't let the doorman intimidate you. Just make sure you have a booking. Definitely one to visit for the novelty alone - the tavern is wonderfully quirky, from the email you receive on booking to the tipsy teas served on the day! The tavern is tucked away in an unassuming alleyway in Mayfair - as soon as you enter the townhouse, you're transported to another era. Some may find it a tad contrived but I really enjoyed the eccentricity of it all. The tipsy tea itself was delicious - can't say the same for our sandwiches but I don't think that's what you come here for! Another Inception Group establishment, when it comes to unassuming doors in alley ways, this one's a little fancy - coming with their own doormen; who where not very friendly or welcoming at all. A stark contrast to my previous visits. Things progress better once you’re through the watchmen - the interior here is delightfully full of curiosities, and you’re transported back to a time where the world was a lot bigger and pocket watches and elixirs were all the rage. There’s a lot of detail in the interior (do check out the bathrooms) and a light hearted fun to the interior design; however seating is a little lacking and the space a little cramped, making staff dodge and turn to get past patrons - something to note if you’re standing at the bar. The cocktail menu is very extensive so don’t be afraid to ask for help for those who aren’t quite sure what they want. My whiskey cocktail was indeed delicious and well advised by the barman and they do solid classics as well - my whiskey sour, robust and tart. 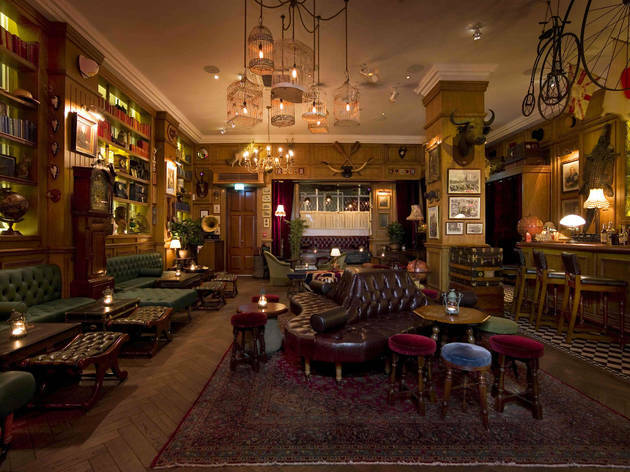 Overall, it’s a quirky little establishment and good for something a little different; however it is a little stuffy and given the price, atmosphere, and quality of cocktails - there are plenty establishments that are friendlier, more comfortable, and equally as quirky to go to in London. Tip: book ahead, otherwise you’ll be waiting out on the sidewalk for a while. They also offer a “Tipsy Tea” if you’re looking for a boozy high tea on weekends. Good For: something special, date night, something different, cocktails. It's quite rare to find a genuinely quirky and non pretentious bar in central London but Mr Fogg's has kind of nailed it. We arrived without a booking as a large group on a Sunday afternoon and the staff were completely accommodating. True we had to wait a fair while for our drinks however there's plenty to keep you occupied in the way of curiosities and paraphernalia hanging from the ceiling and nestled in corners. The cocktail list is extensive but the mixologists also don't hesitate to go off menu for you which is always a plus! Quite possibly my favourite bar in London - I know that's a major statement! The bar itself is great - Phileas Fogg themed venue with a very particular attention to detail - listen out for the radio programme playing in the toilets! The drinks are great - they carry a very decent gin list and the staff know their stuff. It's always best to book here - they don't like to pack the place out which I like - there's always room to manoeuvre which is unheard of in a London bar! Great date place, and I haven't been myself, but I hear the terrace is fab on a sunny day! Thumbs up from me! 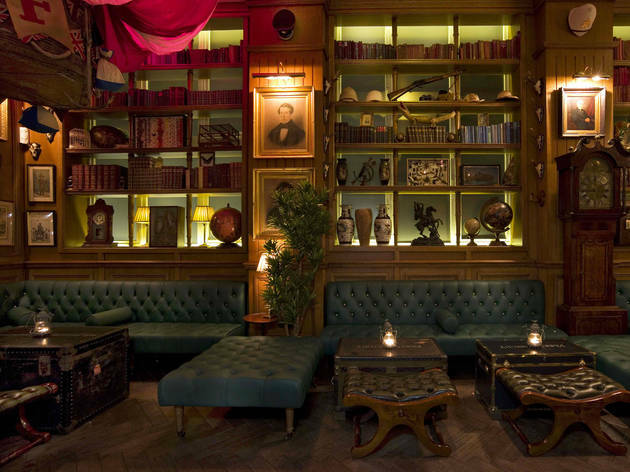 Mr. Fogg's Mayfair residence is like falling down the rabbit hole. You enter with a knock and are greeted by an extraordinary display of eccentric Victorian artifacts. We sat underneath an alligator and next to a wild boar - not your usual companions for dinner - but great fun. The Tipsy Tea was nice and what was there was really delicious; who doesn't love chocolate truffles? The only thing I'd question is their portion sizes. For £38 pp, the picture below was to share between 6. I love afternoon teas, but this was definitely one of the smallest I've had and the most expensive. For atmosphere alone, however, this is a house worth visiting. I went for tipsy tea with my friends yesterday. I was somewhat disappointed. The service was extremely slow and having opted for the bottomless champagne cocktails we obviously wanted to get the most of our unlimited cocktails. Our booking was at 3pm and we got our cocktails at 3.50pm! There was also a long wait for the sandwiches/ cakes and when they did arrive I was somewhat underwhelmed. The champagne cocktails are nice and you get a tea pot to share amongst your party. You can also choose different ones so you can try them all. They are easy drinking and very fruity. I would recommend lining a few up as soon as you get the waitresses attention as you could be waiting a while for a refill. There are much better Afternoon Tea options in London and for £90 pp including service I expected a lot more. Especially as we were still left hungry and went to the pub down the road for a bowl of chips after. The staff were not very attentive and there were no apologies for the delay. Even a glass of tap water took 20 mins to arrive and we had to ask twice. Quirky experience but not great value for money. Favourite place in London! Came here for drinks and I think it serves by far the best whiskey and gin cocktails I have had. The decor is interesting and service is great. Definitely a nice and unique place to have a catch-up with friends. I went to Mr Fogg's this Sunday for their original tipsy tea! The venue is amazing, so different that what I am used to see. We were seated in the veranda which is really beautiful. I opted for a champagne tea pot which was absolutely delicious. Regarding the food, I was a bit disappointed by the cakes which were not really original neither really good. But now I tried their champagne tea, you can be sure, I will go back to try their cocktails! No doubt they will be as delicious as the tea! I have to admit that I am completely and utterly enchanted by this place. I went there for a birthday party the other week and little did I know, that I would enter a different world. You are greeted in front of an amazing looking wooden door and you feel like you have fallen down the rabbit hole once you are inside. Being distracted by the impressive interior of the bar it took me a while to get a chance to look at the drinks menu, this being said, it had another Wow effect on me. All cocktails sound really well put together and it's pretty hard to decide. As already stated in various other comments the staff is not only attentive and polite, but boy, do they know the drinks by heart and they found the right cocktail for everyone in our group. 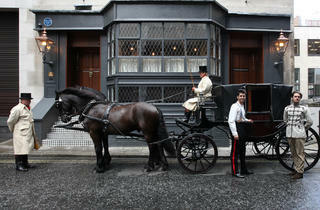 It is an unexpected place in the heart of Mayfair and definitely a gem worth going. If you love all-things quirky and you love cocktails, then this is the place for you. Mr Fogg’s Residence is brilliant. Only a few minutes walk from Oxford Circus tube station, this establishment gets all quirky from the moment you arrive from the heavy knocking of the front door required to be let in, the stuffed animal heads that adorns the walls, the antique typewriter and the ornate grandfather clock. All this before you’ve sat yourself down and looked at the massive menu. Don’t be alarmed by the massive collection of drinks open to you. The fine, charming staff are brilliantly in helping you narrow down your choices based on your preference and they definitely their stuff. You’ll be sure of finding something that tickles your fancy. There’s no queuing here at Mr Fogg’s as you are served at your table. If you’re planning on heading over with a group, there are options available perfect for groups. If you have a larger group, there is an outdoor terrace that can hold up to 25 of your mates. Perfect for those summer days and nights. Here’s a little tip: head on a Wednesday or Thursday night. The resident magician pays a regular visit to Mr Fogg’s so if you see him around on those night, you might be in for your magic show. Impressive tricks too. If you fancy trying one of the more quirkier cocktails, ask the staff to point out cocktails with a quirky presentation. A few theatrics is never a bad thing. A quite brilliant cocktail venue. Perfect for any occasions and I would definitely recommend anyone to check this place out. First time being at Mr. Fogg's makes you feel like you have entered a secret society place and I believe that is exactly the kind of vibe this place is going for. Secluded, with mysterious entrance door, funky decor and almost always fully booked, especially 2nd part of the week. It's prime location attracts interesting mix of people. Cocktails are definitely delicious, I would recommend getting the one served in a tea cup, gives it a nice touch! I almost don't want to write a review for Mr.Fogg's as I fear it will get even more popular and well known and I will never get a seat anymore! Definitely book well in advance for this one. The cocktails are quite pricey, but some of the best in town. Mr. Fogg's would have been a great addition to any London neighborhood, but in Mayfair it really stands out and is a great alternative to pretentious bars or your usual pub. I could sit there for hours just looking at the decorations! Great little bar tucked away in the back streets of Mayfair. Worth calling or emailing ahead to make a reservation as this place gets packed! Cocktails are nice and it really does feel like you are sat in someone's living room which means that it is super comfy to chill for a few hours! This bar can be quite difficult to get into without a booking but if you do it it is great! Very warm and quirky, much better in winter than in the summer. I have been here many times and the cocktails are really nice and the service has always been on point. 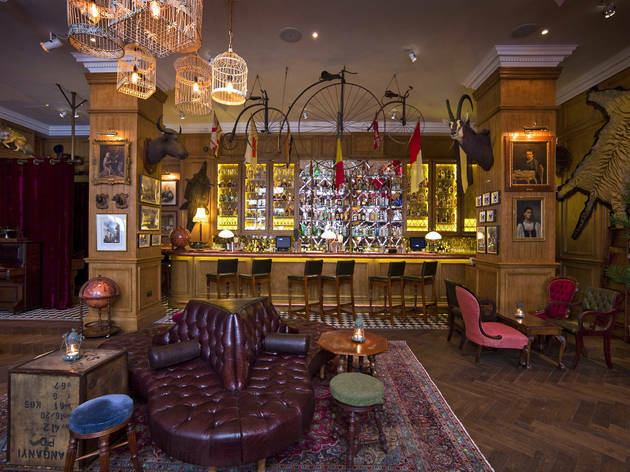 Based on the character Mr Fogg from ‘around the world in 80 days’ this small and vibrant bar is aptly decorated with bird cages, half a hot air balloon, bicycles hanging from the ceilings and a global selection of drinks. There is no room for dancing but it’s a perfect size for making new friends or just sitting back and people watching in this unique setting. I feel that you can always tell how good a bar is by the age range it accommodates, at 60 I still want to be that well dressed lady at a classy yet trendy bar in London on a Saturday night. When a classy friend, said she wanted us to arrange her a classy hen do, we hit Time Out in search of the best cocktail bars in town. Time after time, Mr Fogg's came up, so we booked a table, agreed we'd spend at least £30 a head (as per the website) and made our way to Mayfair. 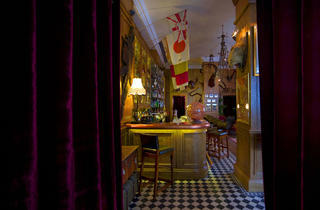 Inside the bar is smaller than it seemed online, decked in loads of fun nick naks and top to toe in dark wood. The menu didn't disappoint - it was rammed with what seemed like hundreds of fun sounding cocktails. We ordered and waited what seemed like a short eternity for our drinks to arrive. When they did, they packed a punch and looked amazing. Whilst it was a perfectly nice place to spend an evening, I won't be going back. This is the sort of bar you come to take photos and say you've been. The atmosphere was really lacking and the service was painfully slow. We would have spent more had we got our drinks a little quicker. Pretty painful on the purse strings too. Isolated old-fashioned cocktail bar in the heart of Mayfair. There is a charming door man dressed in a Victorian-esque outfit who has to ring the bell before allowing entry. Theme of the bar is Phileas Fogg related … didn’t see that coming, did ya? 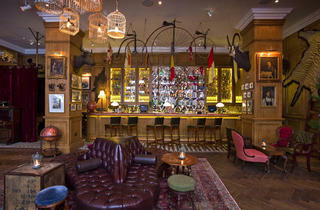 Very cool interior with penny farthing bikes, bird cages and a semi inflated hot air balloon hanging from the ceiling! The lighting is good, not too dark and the music is mellow; doesn’t overpower conversation. The staff are very friendly and help you choose the right cocktail, the selection is vast as is the sheer number of liquor bottles behind the bar! I liked it ... but there wasn't anything spectacularly different about it and the cocktails were slightly overpriced for what they were. Perfect for 'let's try cocktails somewhere different this week', because at £42 for two cocktails, some beef jerky and mixed nuts to share it's not a cheap night out but it's definitely different. The Phileas Fogg theme means you can spend a good hour just staring at the junk on the walls - from the penny farthings above the bar to the taxidermy on the walls and parachutes above a ceiling lamp - and imagine you're in a gentlemens' lounge in Victorian times, about to chat to Phileas Fogg himself. It's all surprisingly tacky (in a good way) for a Mayfair joint. Underwhelming. Nice decor and loved the stories played in the toilets. Went for afternoon tea, the food was crude and drinks average. A solid 3 stars for me (which means generally good). Love the decor in this place, it's fun, it's a speakeasy, it's beautifully decorated. I found the staff to the friendly and I like that they play you creepy fairytales in the loos. The drinks were really mehhhhh for me though. I love a cocktail or 12 and these just didn't cut it compared other London drinkeries. Unnecessarily fussy, in my opinion. Stick to the classics, have a few wildcards, and that would be much better, Mr Fogg. One of my favourite watering holes! The service is fantastic and helpful. Yes the drinks are quite pricey but the servers make sure to keep snacks topped up for free and it's a beautiful place to while away an hour or two. Great venue. Tucked away in a side street, even getting in feels like an adventure. The decor is novel and clever, and the cocktail list is extensive. Great choice for a first, or fifty-first date, but be prepared to splash out. Quite a little gem to dazzle friends with on a birthday or visit to London. Drinks are creative (but, of course, expensive), atmosphere is warm, music is good, fellow drinkers have style. A little disappointment about a reservation policy requiring a credit card number.. that will never do - please Mr. Foggs have a think about this - but overall such a nice place to go and unfurl. A strong four stars - the only reason not a 5 is cost of cocktails & credit card nonsense. Simple AMAZING. Great local. Nice bar with his own soul. You must visit it!! Hidden down a dark side road in town, finally I can see a bar with no name. Kitsch 1920's doorman hang outside and greet me by calling me ma'am. Do you have a reservation they ask, thankfully the answer is yes. They ring an old fashioned door bell and I enter the world of Mr Foggs, escorted to the drawing room to my table I marvel at the lions head and gaitor skin on the wall. Full of Mr Foggs antiquities and 1920's music, the drinks are served in lead crystal, and beers in silver tankards, I love this place. A trip to the bathroom is a delight, old fadhioned and pretty loo's with the Jules Verne novel read out around you. This place is fun, quirky and beautiful. I cannot recommend it highly enough. 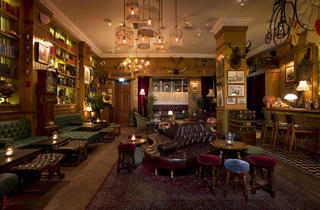 Down a rather shabby lane (well, for Mayfair anyway) you'll find this wee little gem of a bar. As we arrived a lovely looking young boy was being turned away; book a table, is the moral of this story. We smugly breeze pass him and a doorman dressed in faux 1920s attire greets us with his little black book. Our names are written down. I thought this was a lovely touch. Sadly, we entered and there was a posh, modern, beautiful iPad with our actual reservation (the app most restaurant managers would dream of). Anyhow, we were seated. Water and crackers were bought to us for FREE! Great, I think. I do love good table service. The bar was busy. Full of the people you might expect in one of these places. I am glad I wore heels! Then we waited. And waited. Discussed the option of heading up to the bar to order. Then finally we were served. I opted for a Fish bowl punch. As alcoholic as you might expect and garnished with a bit of tree. Is this the new thing? Are twigs from the local tree in Green Park in vogue these days? Our bill was noteworthy. Sixty quid for four cocktails. But this is what you get in Mayfair. Overall, I enjoyed it. The little extras are lovely, the décor is superb and the cocktails are delicious. I don't think I would go again but is definitely worth taking the girlfriend as a special treat or just a mid week date. Incredible attention to detail! Absolutely loved this place....Almost reluctant to let the secret out!